After 55 seasons as San Diego's NFL team, the Chargers have announced that they will be leaving America's Finest City to return to Los Angeles, where the club first started in 1960. It was all but a foregone conclusion after the downtown stadium initiative was voted down during the 2016 election, but die-hard fans remained optimistic that Chargers owner Dean Spanos and family would keep their National Football League team in San Diego. The club made their announcement this morning, well before the January 15th deadline, that starting with the 2017 season, they would return to playing in Los Angeles, where the team began in 1960 before moving south to San Diego the following year. Immediately following the announcement to ESPN, the team changed its name and logo on its social media and website and issued the below statement. Although we were never Chargers supporters, nor do we watch football for that matter, we feel for San Diego and all those longtime fans. Hopefully Qualcomm Stadium and its surrounding area is revitalized and used for something positive and truly beneficial to our great city. A giant homeless shelter, perhaps?? For more information the Chargers relocation to Los Angeles, visit ESPN.com, check out today's LA Times editorial and read the Chargers' press release below. 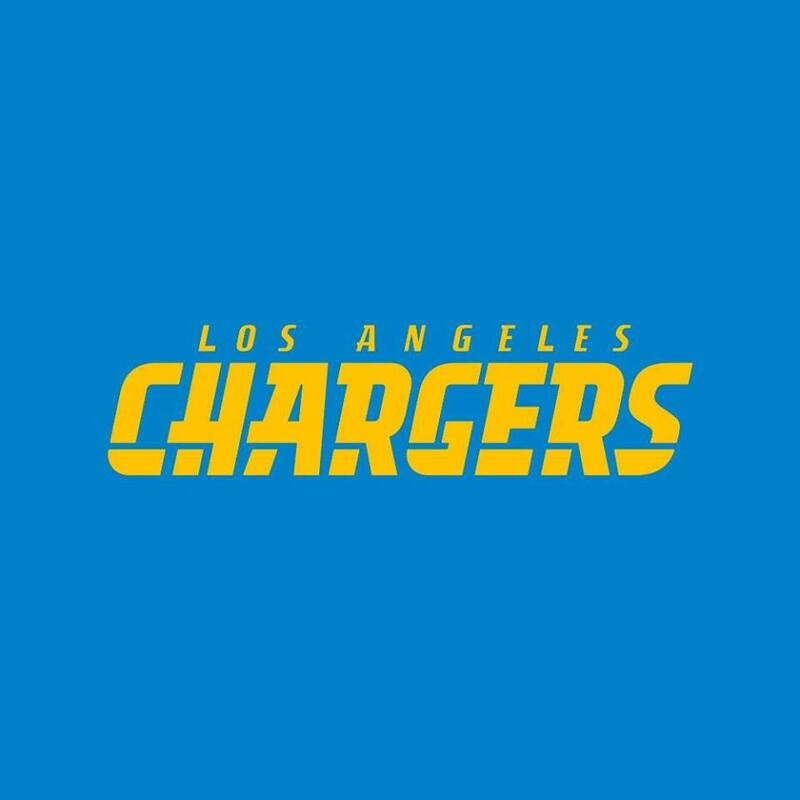 Dean Spanos, Chairman of the Chargers, announced this morning that the team is relocating to Los Angeles and will begin the 2017 NFL season as the Los Angeles Chargers. “The Chargers are determined to fight for LA and we are excited to get started,” he concluded. The full statement from Spanos can be found here. 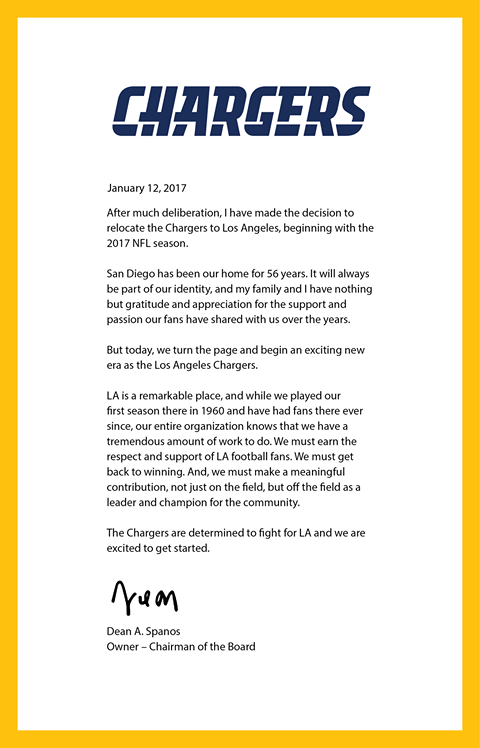 As this announcement was made by Spanos, the team launched www.FightforLA.com, a website that allows fans to place a fully refundable $100 deposit on season tickets for the 2017 season. Current Chargers Season Ticket Members will maintain their priority status and are not required to make a deposit. www.FightforLA.com also revealed that the Chargers temporary home will be StubHub Center, located on the campus of California State University Dominguez Hills in Carson, which is owned and operated by AEG. Capacity for Chargers games at StubHub Center will be 30,000 seats, with approximately 3,000 premium and field seats, 46 suites, 16 cabanas, and 10,000 on-site parking spaces. The fully-refundable $100 deposit allows fans to reserve up to four seats at StubHub Center, ensures priority status for 2017 Chargers season tickets, and grants priority status for seats at the new Los Angeles Stadium at Hollywood Park, the future home of the Chargers. The Chargers also revealed a new advertising mark borne out of the team’s iconic lightning bolt and historic shield introduced in the 1960’s. This new mark and fresh take on “LA” is part of a larger identity campaign called “Fight for LA” intended to convey the commitment of the Spanos family and entire Chargers organization to earn the respect and loyalty of Los Angeles football fans. The new mark can be found at www.FightforLA.com.